I featured a bunch of cute ZARA baby products a while ago and a nice reader left a comment linking to this really cool DIY Sheepskin Rug post. 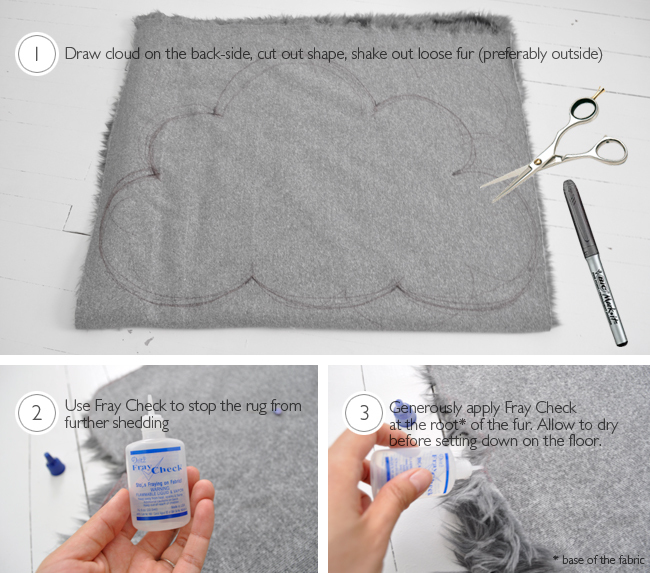 I was inspired to give it a shot and finally finished my Cloud-shaped Faux Sheepskin Rugs for the nursery this weekend. I purchased a yard of "Grey Shaggy Pile Faux Fur" fabric from this ebay seller (they also have a website). At first I was afraid the fur was too long, more hairy than puffy... but now that I'm done and the rugs are in place, I love the way they look and feel! Keep in mind that because I painted my floors using paint with an eggshell finish, I didn't need to attach a non-slip backing to my rugs. Depending on what type of floors you have, you may need to add some sort of anti-slip pad or stickers to the bottom. Ikea sells really cheap anti-slip pads. You could make a huge cloud or like me, make a couple. 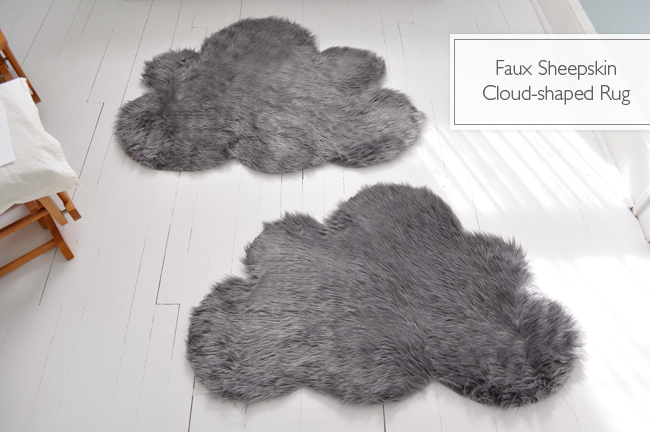 I was able to make two decent sized clouds out of the 1-yard I purchased. Step 1. Draw your shape on the back-side of the fabric with a permanent marker. If you're using grey fur, I suggest using a grey marker or disappearing ink fabric marker (if not, a pencil will do). Cut out the shape then shake out to remove excess fur/fibers - I suggest doing this outside or else you'll have fur everywhere, including in your mouth :) Stop after a couple of shakes, don't worry if you still see fur flying around. You really just want to shake out the fibers that were loosened-up from cutting. Step 2 & 3. Generously apply Fray Check (I buy it at Michaels) at the base of the fur (where the fur is attached to the base fabric) all around the rug. Allow to dry wrong-side up or hanging before laying down on the floor. They are AWESOME! Great idea! want. need. for. playroom. you. are. genius. You are brilliant my friend! Just Adorable!! My Granddaughters Nursery may need these too! Aww, this is DARLING! I just clicked over from Creature Comforts. I have to make this! And I would love to link to this if you didn't mind. Brilliant, cute, and like nothing I've seen before! Hope you don't mind. Thanks! Thank you so much for all of your comments! I'm so glad you all like the rugs. For those of you who plan to make your own faux rugs - I'd love to see the results!! AND of course, please free to link back!! oh my, just beautiful! great idea! I have a thing for clouds at the moment. I love this. It's going on my to do list! I just made a cloud mobile which you can see here if you like. I found you on One Pretty Thing. Off to explore. I love these! Thank you for sharing this! I can't wait to try to make one! Definitely makes me wish our bedrooms weren't carpeted. Maybe in our next house. In the meantime I'll be brainstorming other spots for these awesome rugs! Love this! I'm going to try one next time! My kids have a rainbow bathroom that needs these!! I am going to share a link with my readers! Thanks for sharing the tutorial with us! I love these! I just got some sheepskin slippers and they are to die for. Sheepskin is just so super plush and wonderfully comfortable. I love them. Thank you for sharing. What a great tutorial! This is such a beautiful idea !! I really wanted to pin it to make later but Pinterest says your images are blocked? These are soo cute! I cannot wait to try to make them myself! Thanks for posting - they are just lovely - perfectly grey and just beautiful. Thanks for posting this - I want to make something similar (but a fish shape) and was wondering about the edges. I'll look for fray check at our Michael's. I also have this linked to my rugs post today, your post is a keeper!